It’s always entertaining to listen to the attempted rationale of someone who supports eating meat, despite the proven devastating and unsustainable impact of rearing livestock and intensive farming clearly pointed out, and the ethical and moral issues of speciesism made clear. Animal lovers eating meat and supporting an industry of misery, torture, exploitation and death – what’s there to disagree with? Some will always come up with “Well, if we all went vegan all farm animals would die out, which is cruel…” and “We can’t survive without meat” type arguments (you know, the usual ones, to which there is always a valid and logical counter-argument). Be on the right side of history. Go vegan. We’ve all been there. Someone decides to pick apart your vegan diet, accusing you of being on the brink of certain death, despite the fact you know damn well you eat an amazingly balanced and nutritious diet, while your carnivore interrogator lives on cheese, nuggets, baked beans and pot noodles. Well, here’s all that nutrition info on vegan diets you needed, which you can either digest and repeat, or print out and shove up their nose. Big agriculture (meat production and consumption) has a lot to answer for. Eat meat daily, which we absolutely don’t need? Or have access to clean, fresh drinking water daily, which we absolutely do need? I know which we should be choosing and insisting upon. Another marine species will, most likely, bite the dust. For what reason? An Asian delicacy of “fish bladder”. Those of us in the UK, please take a moment to send this email to your MP asking them to vote against a repeal of the hunting act. I’ve just had a revelation. Hot summer’s day. High temps in the garden. Cool, light vegan snack needed! I usually knock up a salad of leaves, plain cashews, cucumber, raw onion, grated carrot and whatever else might be in my fridge/cupboard that week, drizzled with olive oil and sprinkled with rock salt and black pepper. Today I reached for some plain hummus that I’d bought in the food clearance isle – it needed eating. Hummus needs something crispy as a complementary texture, so I grabbed the GF crispbreads lurking in the cupboard. 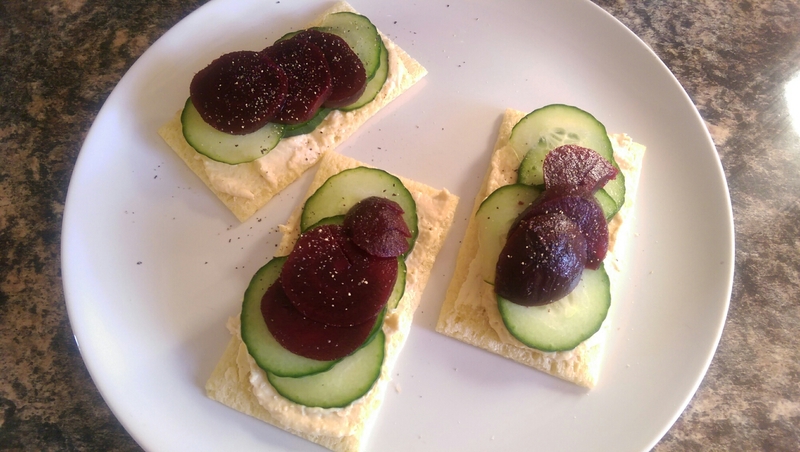 I smeared the hummus liberally, then placed sliced cooled cucumber underneath sliced boiled beetroot. Sprinkle on some ground black pepper. Et voila. I have to say, the combination was entirely accidental, but the flavours really work – amazing. A simple, light, vegan and low calorie summer afternoon snack to quite literally “oooo” and “ahhhh” over. Yum. Nothing we hadn’t already worked out, sadly. The inhumanity and short-sightedness of humans is astounding. So very sad. Lovely to see two orphaned eles in India reintegrated into a wild ele herd. This is true conservation. It’s not surprising that whales are starving to death. Most natural systems are collapsing due to human behaviour and destructive processes.